Danaher Corp is run on many of the principles embodied by Warren Buffett's management of Berkshire Hathaway. 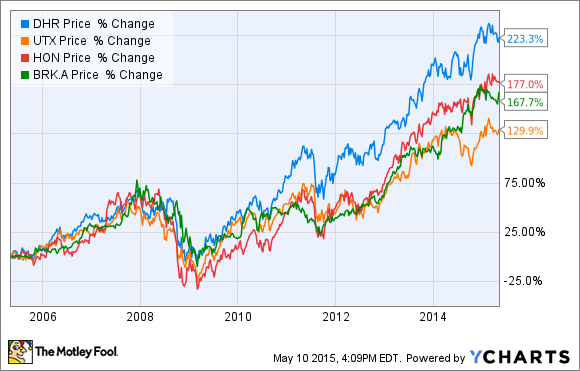 I'll cut to the chase: it's Danaher Corp. (NYSE:DHR) Why? It's simple. Throughout the last 20 years or so, the conglomerate has incorporated many of the principles that made Warren Buffett so successful. In fact, I would argue that Danaher's management has run the company almost in the manner of an investment firm such as Buffett's Berkshire Hathaway. An argument which is only strengthened by the recent agreement to purchase life science filtration company Pall Corporation (UNKNOWN:PLL.DL)--a move which was suggested in a Fool article on takeover targets for 2015. Let's take a closer look at why investing in Danaher stock is something that could suit Buffett and what the Pall Corp deal means for investors. As the chart above demonstrates, Danaher has significantly outperformed its peers, and Berkshire Hathaway, over the last ten years. Danaher isn't the most well-known company -- for a primer on the company, check out this recent earnings review -- but after a long period of consistent growth its market cap now stands at around $62 billion. Indeed, the growth has put the company in a financial position to buy Pall Corp for $13.8 billion. Danaher's intent is to create a science & technology company, retaining the Danaher name, by merging its existing dental and life science & diagnostic segments, with its water quality, product ID business and Pall Corp. Meanwhile, the remaining industrial businesses will be merged into the creation of a company called NewCo. "I am committed to building and reinforcing the DBS culture and ensuring the company exceeds our customers, shareholders and associates' expectations." The Pall Corp deal is expected to close at the end of 2015, with the separation of Danaher and NewCo taking place around the end of 2016. Buffett built his reputation by buying a series of unfashionable and undervalued companies and then increasing their productivity over time, and Danaher's story is similar. Essentially, the company is known for buying relatively unloved businesses and then applying its so-called Danaher Business System, or DBS , in order to increase their return on capital. In fact, Danaher has bought more than 400 companies since 1984, with the Pall Corp deal being largest to date. The DBS is essentially a set of core principles embodying lean manufacturing processes and, continuous improvement. An example of DBS in action is Danaher's 2011 purchase of Beckman Coulter for $6.8 billion. Since then, Danaher has increased operating margins at Beckman Coulter by more than 700 basis points. Buffett would love this kind of increase in productivity. After all, he grew Berkshire Hathaway by buying companies with the intent to increase their return on capital and free cash flow generation. As you can see from the following chart, Danaher is extremely effective at increasing free-cash flow as well. 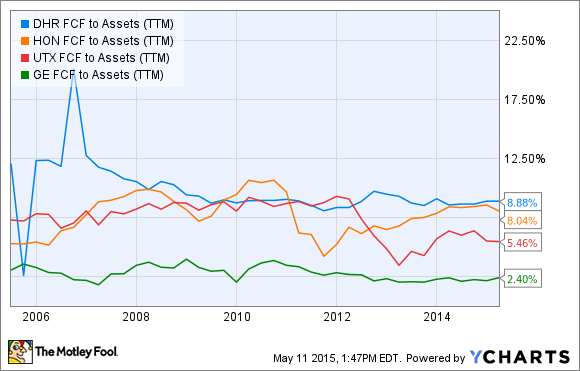 DHR FCF to Assets (TTM) data by YCharts. In addition, with a miserly trailing dividend yield of just 0.5%, Danaher shares Buffett's predilection for reinvesting free cash flow in order to generate earnings growth for investors rather than pay it out in dividends. Over time, Danaher's portfolio of businesses has grown to cover areas as diverse as water treatment systems, fuel dispensers, packaging printing, dental equipment and consumables, and life science and diagnostic systems. In other words, precisely the kind of seemingly mundane "old economy" businesses Buffett is known for purchasing. "Pall is a highly attractive business, with approximately 75% recurring revenues, mid-single digit organic growth and a solid margin profile." The Pall Corp deal will strengthen Danaher's position within the life science industry, just as Buffett favors buying company's with strong market positioning. My argument is that Danaher's policy of acquiring business and then applying its DBS to enhance productivity, is a similar sort of strategy that Buffett undertook with the businesses he bought for Berkshire Hathaway--and the Pall Corp deal is further evidence of this. Moreover, since Danaher's management, and NewCo's future management, confirmed that DBS remains at the heart of how the companies will be run, then anyone buying Danaher stock right now will be buying into the same Buffett-like principles that proved so successful over the long-term.